Explore two centuries of innovation, entertainment and international relations through the rich history of world’s fairs. From the Eiffel Tower and the Space Needle to the invention of television, chewing gum and hot dogs, world’s fairs have shaped our world. This resource digitises primary source material from hundreds of fairs – a vital collection for students of globalisation, imperialism, anthropology, mass communication, design and more. This digital resource offers a unique insight into the phenomenon of international expositions. Over 200 world’s fairs and exhibitions, spanning 1829-2015, are represented through a range of primary sources. From planning committees to public reception and the legacy that remains, the impact of these global events can be examined in a comprehensive context. 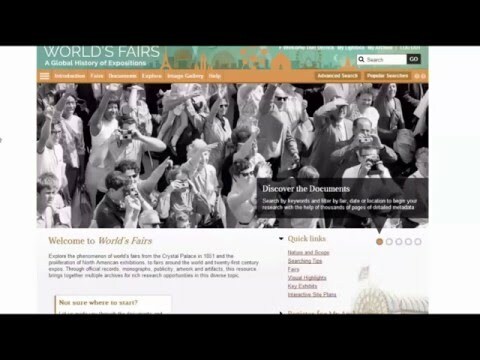 World’s Fairs is a vital resource for students, teachers and researchers of a huge range of subjects including imperialism, race relations, gender studies, science and technology, consumer culture, architecture, design and more. Case studies of nine of the most significant fairs offer in-depth analysis of their impact and legacy, including the 1851 Great Exhibition, London, 1893 Chicago World’s Columbian Exposition and 1939/40 New York World’s Fair. A wealth of visual material including souvenir objects, photographs, posters and plans.